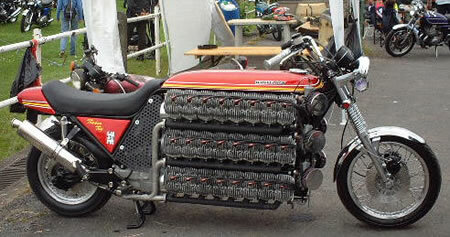 Wow, it's a motorcycle with 48-cylinder engine! This is guaranteed, your eyes are not deceiving you or photoshopped neither. Simon Whitlock has created a custom 48-cylinder, 4,200 cc two-stroke motorcycle by bolting a bunch of engine parts together named the 'Tinker Toy'. This bike holds the Guinness World Record for the most cylinders on a land vehicle. This insane bike is made from a series of engines pulled from Kawasaki S1/KH250’s and boasts of a total displacement of 4,200 cubic centimeters, and has six, inline-eight engines. All these inline-eight engines come with their own crankshaft and are tied together with gears and run through a BMW transmission, as the bike is pretty long already it would be difficult to put a transverse drive thru a gearbox. This unique motorcycle has a small 75 cc tiny engine under the seat to start it and the ignition is by 6 x 8cyl E-Type Jaguar distributers. It has taken almost three years of hard work and he has overcome some huge problems to get here. Oh, by the way, Simon is not an engineer.